Eve Clinic, Fareedhee Magu, Malé, 20256, Maldives. Becker’s nevus (BN), a cutaneous hamartoma, is usually seen in the upper half of the trunk during puberty. Location of BN at other sites is an exception. The theory of somatic mosaicism and androgen sensitivity supports the origin and characteristics of BN. 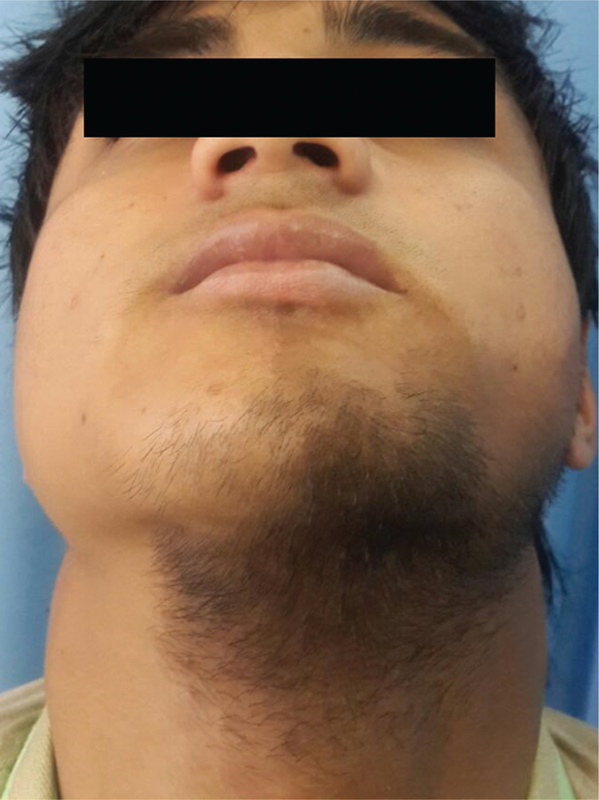 Here, we report an interesting and unusual case of BN on face with asymmetric growth of beard and acne on the same with complete absence of hair on other side of the face. The author aims to highlight a rare clinical presentation of common condition and the first of its kind from Nepal. Becker’s nevus (BN), a cutaneous hamartoma, has been described along with cutaneous and structural abnormalities . It may be present at birth, but most cases of BN with hypertrichosis are first noted at puberty. It is more frequently seen in male than female individuals ,. Lesions usually have geographical or block-like configuration; however, linear configuration has also been described. It typically appears on the upper half of the trunk or on the proximal upper extremities . However, the occurrence of BN on face with asymmetric growth of beard has been rarely reported in literature. 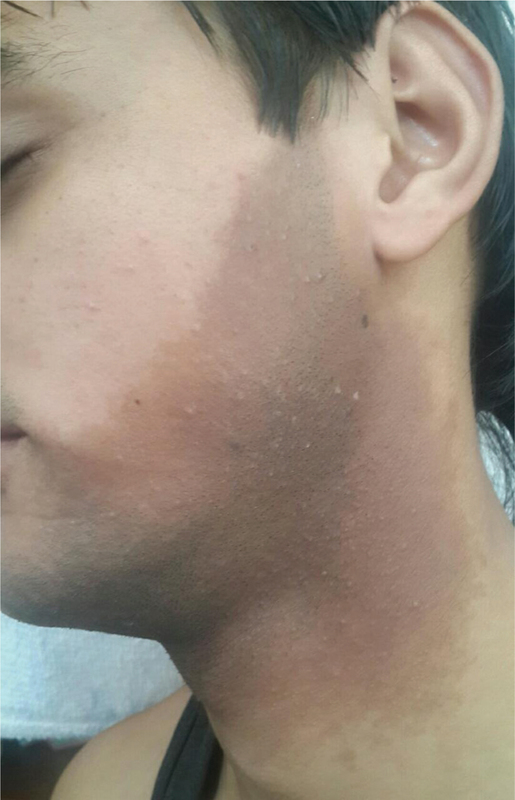 A 19-year-old male presented with an asymptomatic hyperpigmented patch with hypertrichosis and multiple pustules localized to the left cheek. The hyperpigmentation was noticed at birth which became conspicuous over the years. During puberty, the patch was covered with hair and acne. To patient’s surprise, he had complete absence of beard on the other side of the face. Examination revealed a hyperpigmented patch (5×10 cm) with geographic pattern over the distal half of the left cheek, chin, and neck ([Figure 1],[Figure 2],[Figure 3]). Within the confines of the lesion, thick strands of coarse hair with multiple papules and pustules were apparent. However, the hair on the opposite cheek was almost compared to nil. No neurologic or musculoskeletal abnormalities were seen. Serum androgen level was normal. Lesional biopsy revealed hyperpigmentation of the basal layer of epidermis with scattered melanophages in the upper dermis ([Figure 4]). There was no underlying smooth muscle proliferation. Distinct clinical findings with histopathological examination confirmed the diagnosis of BN. Figure 1 Becker’s nevus covered with coarse hair (beard) on chin extending to left side of the face. Figure 2 Clear picture of Becker’s nevus studded with multiple pustules (acne) seen on left side of the face after shaving. 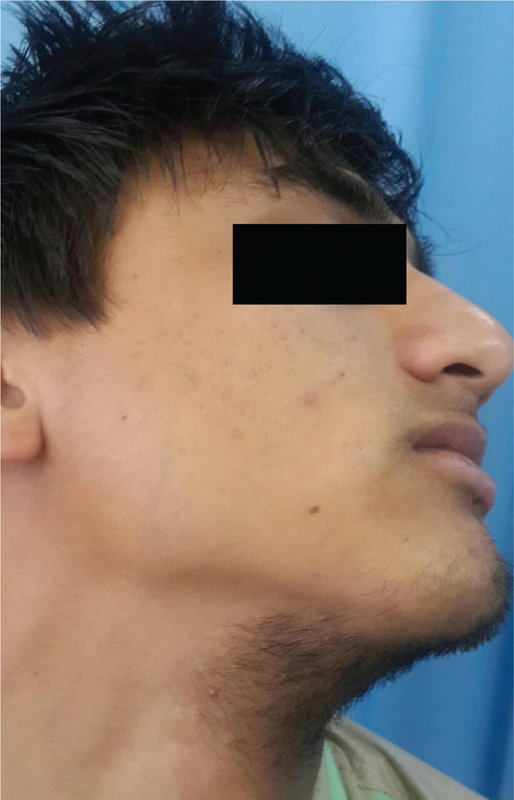 Figure 3 Complete absence of beard on the Right side of face with relatively few acne lesions. 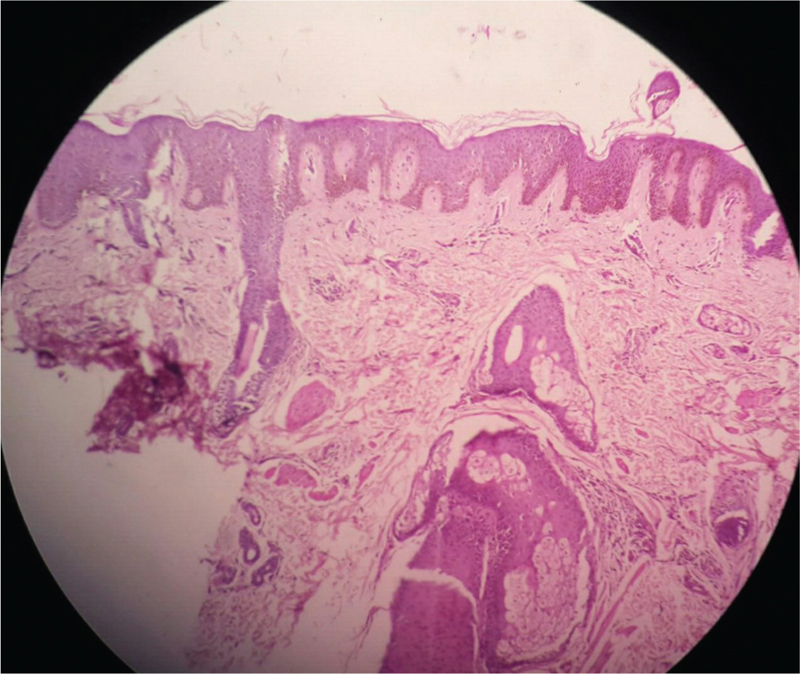 Figure 4 Skin biopsy from the lesion showing hyperpigmentation of the basal layer of epidermis with scattered melanophages in upper dermis (Hematoxylin and Eosin, 40X). In 1949, Samuel William Becker first described a ‘concurrent melanosis and hypertrichosis in the distribution of nevus unius lateris’ which has since been termed BN . It is characterized by a patchy hyperpigmentation with irregular outline and hypertrichosis. Most often it is acquired; however, autosomal dominant inheritance with variable penetrance has been hypothesized. BN is more common in male individuals, with a male to female ratio of 5 : 1 . It usually occurs during puberty. The exact pathogenesis of BN is unknown. The theory of cutaneous mosaicism supports the origin of BN. Formation of a clone of vulnerable cells during embryogenesis predetermines the development of BN. Appropriate triggers such as hormonal change or sunlight exposure may result in its occurrence. BN follows a blaschkoid, checkerboard, phylloid pattern or a patch without midline separation due to somatic mutation where the abnormal phenotype expression occurs only in the affected segments of the body resulting in a linear or block-like configuration. The occurrence of two asymmetrical BN in the same person supports the cutaneous mosaicism (somatic), in which two or more populations of genetically different cells are derived from the same zygote. BN follows the type 2 clinical pattern (checkerboard pattern) of cutaneous mosaicism as described by Happle ,. Hypothesis of hormonal hyper-responsiveness (i.e. androgen sensitivity) in BN explains the lesion more prone to acne, hypertrichosis and its predominance in peripubertal males . Increased expression of androgen receptors and androgen receptor mRNA has been found in dermal fibroblasts of BN which supports this hypothesis . Androgenic pathogenesis has also been suggested based on its less frequent occurrence in females; moreover, hypertrichosis and hyperpigmentation are relatively less appreciable in affected women. Hence, cases of BN in female are often under-reported. Polat and colleagues reported similar case of BN on face with asymmetric growth of beard ,,. Two BN on the left side of the face in a segmental distribution with extension onto the oral mucosa have also been reported. Various noncutaneous abnormalities are association with BN that include aplasia of pectoralis muscle, hypoplasia of breast, limb shortening, scoliosis, congenital adrenal hypoplasia, spina bifida, hallux valgus, and pectus carinatum ,. Literature on the occurrence of BN on face accounts for less than handful of cases. Co-existence of lesion with excessive hair growth and acne, as in this case, further supports the androgen sensitivity hypothesis. However, almost complete absence of beard on the contralateral side of the face despite normal mustache and normal hair growth on other parts of the body is difficult to explain. The author acknowledges Dr Dipti Gautam, MD Pathology, for the histopathological examination of the biopsy from the lesion. Formigon M, Alsina MM, Mascaro JM, Rivera F. Becker’s nevus and ipsilateral breast hypoplasia. Androgen-receptor study in two patients. Arch Dermatol 1992; 128:992–993. Ro YS, Ko JY. Linear congenital Becker nevus. Cutis 2005; 75:122–124. Bansal R, Sen R. Bilateral Becker’s nevi. Indian J Dermatol Venereol Leprol 2008; 74:73. Happle R. Mosaicism in human skin. Understanding the patterns and mechanisms. Arch Dermatol 1993; 129:1460–1470. Dasegowda SB, Basavaraj GB, Nischal KC, Swaroop MR, Umashankar NP, Swamy SS. Becker’s nevus syndrome. Indian J Dermatol 2014; 59:421. Grande Sarpa H, Harris R, Hansen CD, Callis Duffin KP, Florell SR, Hadley ML. Androgen receptor expression patterns in Becker’s nevi: an immunohistochemical study. J Am Acad Dermatol 2008; 59:834–838. Polat M, Kaya H. Asymmetrical growth of beard due to Becker’s nevus on the face: a rare presentation. J Eur Acad Dermatol Venereol 2016; 30:129–130. Kılıç A, Kaya L, Gül U, Soylu S, Gönül M, Demiriz M. Becker nevus on face with asymmetrical growth of beard hair. J Eur Acad Dermatol Venereol 2008; 22:235–262. Guarneri C, Lentini M, Happle R, Cannav SP. Becker’s nevus on face with asymmetric growth of beard hair. J Am Acad Dermatol 2013; 68 (Supp 1):AB103.